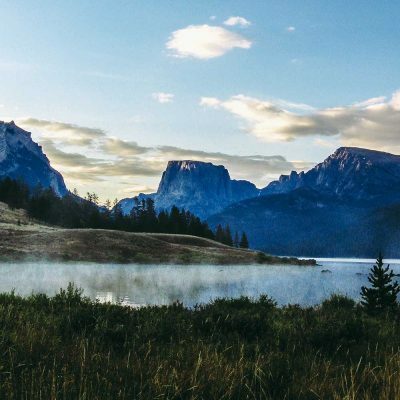 The Wind River Mountains are well-known as a fly fisherman’s paradise with over 1,500 pristine alpine lakes that can house Brookies, Rainbows, Cutthroat and the elusive Golden trout, as well as Grayling in some cases. The world-record Golden trout came out of the Wind River Range and our backcountry fishing trips cover hot spots such as Elbow Lake, which is home to some of the largest Goldens in the range. Our backcountry trips are far-ranging and somewhat customizable, whether you prefer a horse-supported camp or would rather backpack in under your own steam. Backcountry campsite setup, meals and outstanding fishing opportunities with the help of expert guides from Two Rivers Fishing Company will make your Wind River adventure unforgettable. Our 3-day guided trips are ideal for weekend warriors who want to pack an exceptional backcountry fishing experience into a shorter time frame. 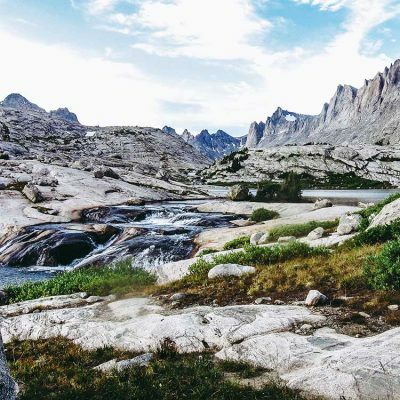 There are 11 trailheads on the Pinedale side of the Divide that all offer access to alpine lakes within a few short miles, making the Winds a go-to destination for some of the best backcountry fishing in the United States. A 5-day excursion into the Winds opens up access to higher elevation lakes and steams, in a closer proximity to the Continental Divide. More time spent around 10,000 feet puts you above treelike and showcases the stunning ruggedness of the range and provides new opportunities for Golden trout fishing not found in some of the lower elevation lakes. Have a backcountry trip in mind but aren’t sure how to make it happen? Our custom trip option gives you the freedom to create the trip you want with guide-supported experience and expertise specific to the area. The options in the Winds are limitless! We can’t wait to hear what you come up with, so shout it from the mountaintops and let’s make your trip a reality. The Wind River Range is the largest mountain range in the state. The Continental Divide creates the spine of the range in its entirety, creating the most scenic and rugged mountain terrain in the Rockies. 19 of Wyoming’s 20 highest peaks are in the Winds, including Gannett Peak, topping the charts at 13,809. With over 180 active glaciers (including the largest glaciers in the Rockies), over 1,500 pristine alpine lakes, a half-million acres of Federally-designated Wilderness and solitude with a scenic backdrop that seems unreal, why wouldn’t you want to experience this playground for yourself? The Wind River Range is home to over 1,500 immaculate alpine lakes. About 500 of them are named, and most of them are fishable. The lakes and streams in the Winds house Rainbow, Brook, Cutthroat, and Golden trout. The world-record Golden trout was caught in the Wind Rivers, making it a destination for those seeking this elusive and distinctive fish. On any trek into the rugged beauty of the Winds, enthusiastic anglers come across fishable water every couple of miles, making it a prime candidate for the best backcountry fishing in the United States. Golden trout are notorious for their elusiveness and their incredible beauty. Their distinctive coloring leaves little to question once you see one. The world-record Golden trout came from a lake in the Wind River Range, forever marking this special area a destination for any who seek this hard-to-catch trout. They thrive in cold water and are typically only found in lakes and streams with late ice-off at elevations of 10,000 feet or higher. Given their harsh habitat, adult Golden trout are typically around 12″ in length, although the world-record Golden was 28″ and tipped the scales at over 11 pounds. What’s included in a backcountry fishing trip? Our backcountry guides are knowledgeable, experienced, and certified in Wilderness First Aid, including CPR. The guides will also have a satellite communication device for emergencies and a First-Aid kit. Your trip also includes food, cookware and bear-proof food storage. Our trips are all-inclusive and you will be provided with flies, rod, reel, backpack, tent, sleeping bag, sleeping pad if needed. If you have your own sweet gear that you wish to use, go for it. If not, we’ve got your back. What should I pack for a backcountry fishing trip? When you register for your trip you will receive a packet of information, including a pack list with both recommended and required gear. 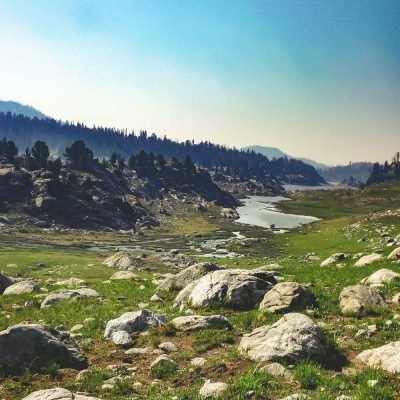 Details specific to your trip, such as whether it is horse-assisted or not, the time of year and the trek itself, will determine what you should pack. As a good rule of thumb, no trip should be taken into the Winds without some basics, and we’ve compiled a list of them here. Remember, the list you receive when you book your trip should be considered the authoritative source on packing requirements. What is your cancellation policy for backcountry fishing trips? A 50% deposit is required to secure a reservation within 7 days of booking your trip. In case of a cancellation, the deposit is fully refundable less a $200 processing fee per person if the written cancellation request is received prior to 90 days of the trip date. For cancellations within 90-60 days of arrival, the deposit is non-refundable. Requests to move an already scheduled trip date will be treated as a cancellation and a new booking. The balance of the trip is due within 60 days of the trip. If a cancellation must be made within 60 days of arrival no refund will be issued. Due to the nature of permitting required for advanced bookings in the National Forest and Wilderness, we can not make exceptions to our cancellation policy. Wyoming weather is often variable-trips will not be cancelled due to adverse weather conditions. If you are at all concerned with the cancellation possibility, we strongly encourage you to purchase trip insurance. Unexpected events do arise and travel insurance is very reasonable. There are many good travel insurance providers, but we recommend Travelguard as a good option. You can either complete the online quote on their website or call one of their agents.